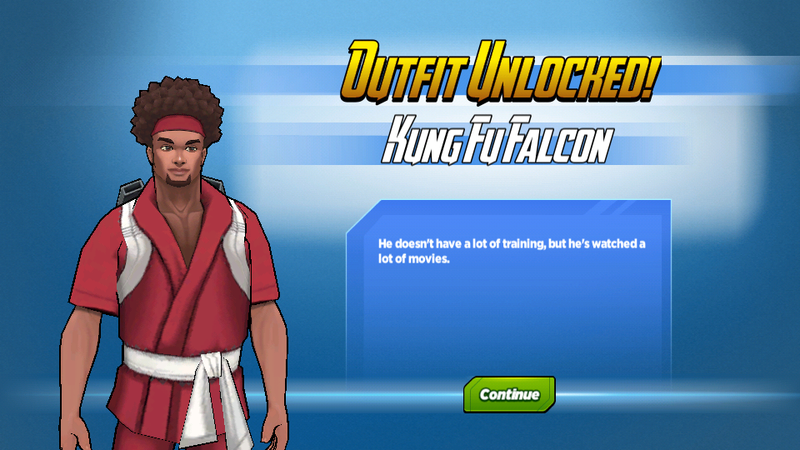 Falcon: All of these ninjas and martial artists have me so hyped! Those were always my favorite movies and cartoons since I was a little kid. Wasp: I always wondered why your room was full of broken bricks. Falcon: Do you think they'd teach me? Like I could be one of these guys for real? Wasp: All you need is an outfit! Falcon: You can make me one?! Wasp: Start growing your hair out to look like an awesome 70's Kung Fu guy! I'll be right back! Wasp: Whoa! Your hair grows super fast! I was mostly kidding, but it looks awesome! Kung Fu Falcon: Thanks! I never tell anyone about my weirdly fast hair growing abilities. This was the look for all my favorite Kung Fu heroes back in the day. Wasp: Go learn Kung Fu! Kung Fu Falcon: I will! Kung Fu Falcon: I am! Kung Fu Falcon: Me too! Iron Fist: Sweet outfit. What discipline do you follow? Kung Fu Falcon: None. I mean, I was hoping you'd teach me a little Kung Fu. I have a passion for it, and I've seen all the movies. Iron Fist: Nice! Let's see what you got! Iron Fist: I love your passion, and those were some solid Kung Fu screams. I think we like a lot of the same movies, but we still have a lot of work to do. Kung Fu Falcon: This is a dream for me, man. I don't mind the work. Iron Fist: Cool. Let's get you ready to fight an undying dragon. Iron Fist: I wanna watch you do some of your regular training. Don't worry about incorporating Kung Fu. Just do your thing. Kung Fu Falcon: Cool, I'll show you my Falcon Punch. Iron Fist: Right on. I think I've heard of that. Iron Fist: Cool, man. Your technique is strong when you know what you're doing. I think it's time to show you a true Kung Fu attack. Kung Fu Falcon: Is it something that looks like it wouldn't hurt at all, but is actually crazy deadly because the technique is so on point?! Kung Fu Falcon: I need to show you the move Iron Fist taught me! Wasp: Awesome! Is it something that looks like it wouldn't hurt at all, but is actually crazy deadly because the technique is so on point?! Wasp: I was totally eavesdropping! Wasp: That was so cool! You totally achieved your Kung Fu dreams! Kung Fu Falcon: It's so much fun. I don't know if I can become a master, but I'm definitely adding it to my regular training. Wasp: And your hair looks so good! Kung Fu Falcon: Let's watch some movies! Wasp: Let's break some bricks! Kung Fu Falcon: Let's punch some dragons! What do you think of Kung Fu Falcon? What do you think of his new moves?